Ab & A Franklin / Kimonos Dresses Etc. Jacob Propos (1871-1926) was born in Russia March 1871 and immigrated to the U. S. in 1888. He is listed as being in business with Jeanette Bernstein to manufacture shirts at 49 Allen St. in 1896. 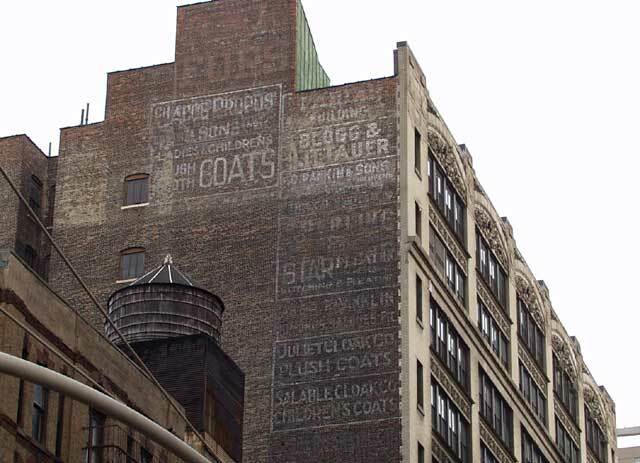 By 1900 this had become "Jacob Propos, cloaks" at 403 Broadway, a few years later at 442 Broadway, and in 1913 at 539 Broadway (as "Jacob Propos, Infants' Cloaks"). His sons, Harry Propos (1892-1975) and William Ralph Propos (1898-1972), had both joined the business by the time of their registrations for the World War I Draft in 1917 and 1918. Harry, age 24, stated that he was a "Salesman, Jacob Propos, 121 W. 27 St." and William, age 20, listed himself as in "Charge of Stock & Receiving & Shipping Dept., Jacob Propos, 121 W. 27 St." (Click for ad with this address in 1920.) The business had moved to W. 27th St. in 1916, and to 151 W. 26th St. in 1922. (Click for ad with this address in 1924.) They stayed at 151 W. 26th St. until 1926. This sign, then, dates 1922 to 1926. Jacob Propos & Sons, Children's and Infants' Clothing stayed in business until around 1931. In 1870 Solomon E. Blogg (1863-1930), of Blogg & Littauer, was 7 years old and lived with his father (Leo Blogg, 40, born Prussia, "fancy goods"), mother (Fredericka, 30), and two sisters (Emma, 10, and Mathilde, 8) at 240 E. 49th St. Ten years later Solomon was listed in the US Census of 1880 as age 17, "helps father / Fancy Goods Importer." Solomon started his own business manufacturing cloaks and suits by 1893 and went into partnership with Paul Littauer (1865-ca1908) around 1901. The business was located at 14 Washington Place at the corner of Greene St. from 1899 until 1912. In October, 1911, Blogg & Littauer were listed among the earliest firms to lease space "in the new building now in course of construction at 151-63 West Twenty-sixth Street" (New York Times, 12 Oct. 1911, p. 14). They moved in 1912 and stayed until 1924. (Click for ad in 1919.) As early as 1918 Blogg & Littauer began advertising for models of buxom dimensions (bust 47, waist 34, hips 41) to model suits in their showrooms. (Click for ad in 1922.) By 1924 Paul Littauer had been replaced by Harry Littauer (son? grandson?). Solomon Blogg died 4 Dec. 1930. Notice of the corporate dissolution of Blogg & Littauer appeared in The New York Times 22 Mar. 1931. D. Pankin was David Pankin (1849-1926), born Russia, immigrated 1893. The sons were Harris Pankin (1876-1958), Isidor H. Pankin (1884-1952), Louis Pankin (1881-1958), and George Pankin (1891-1969). All were born in Russia but immigrated at different times: Harris in 1892, Isidor and Louis in 1895, and George in 1898. The original business was D. Pankin & Son, Cloaks, located at 266 Canal St. The son at this time was Harris Pankin. The business moved in 1907 to 28 W. Houston St. A year later the name changed to D. Pankin & Sons, "Manufacturers of Cloaks and Reefers," when Isidor joined Harris as the second son. (1913 Webster defines reefer as "a close-fitting jacket or short coat of thick cloth.") Around 1910 Louis replaced Harris as the second son. The same father and sons group moved to 151 W. 26th St. in 1920. The business moved to 501 7th Ave. in 1924, now joined by another son, George Pankin. (Around this same time Harris Pankin reappeared but with his own "Ladies & Children's Cloaks" business on W. 20th St.) Around 1925 D. Pankin & Sons branched out from cloak & reefer manufacturers to enter the field of real estate investment. D. Pankin & Sons went out of business around 1930. Louis Pankin remained in the real estate and investment business for several more years, and Harris Pankin formed a partnership with Bernard Harrison to manufacture cloaks until around 1939. George, Isidor and Louis Pankin all registered for the World War II draft in 1942. Isidor and Louis were retired at this time, but George had his own company, George Pankin Co., at 370 7th Ave.
Sperling & Sperling were Isidor E. Sperling (1849-1923) and Adolph Sperling (1860-1928). They were not brothers but originated in the same province of Prussia (Posen) and were very likely cousins. Isidor Sperling immigrated in the early 1870s and is found in the New York City directory of 1884 as a cap manufacturer on Walker St. Adolph immigrated around 10 years later, and the two appear in partnership in 1895 manufacturing cloaks on Walker St. This partnership lasted for the rest of their lives. The firm name, Sperling & Sperling, first appears in 1909 when they were located at 14-16 E. 14th St. They moved to 151 W. 26th St. in 1912 and stayed here as cloaks & suits manufacturers until 1923. Isidor Sperling had 3 sons who entered the business: Samuel Herbert Sperling (1887-1960), Walter Joseph Sperling (1890-1946), and Harold Robert Sperling (1892-1939). All three registered for the World War I draft in 1917 while employed at Sperling & Sperling. Isidor Sperling had a brother, Elias M. Sperling (1845-1918), who was also in the clothing manufacture business in New York. He manufactured "wrappers" (loose-fitting house dresses for women) with Moritz Barin (1857-192?) in a partnership that lasted from around 1894 to 1906. Isidor Sperling and Elias M. Sperling were the sons of Samuel Sperling (1811-? ), a native of Pleschen, Posen, Prussia. (Pleschen in 2007 is located in eastern Poland and goes by the Polish name, Pleszew.) Moritz Barin also immigrated from Pleschen. He is listed as Moses Barin sailing on the Fürst Bismarck from Hamburg 25 Sep. 1891 to the port of New York. Less than a year later the same Fürst Bismarck lists his wife, Bertha, sailing 20 May 1892, with 3 children (Elsa, Selma & Julius). Accompanying them are Augusta and Amanda Sperling, Elias Sperling's wife and daughter. After leaving 151 W. 26th St. in 1923, Sperling & Sperling were in business for another 15 years, closing in 1938. A brief obituary in the New York Times, 19 July 1946, p. 19, for Walter J. Sperling describes him as a "retired partner of Sperling & Orlando, Morristown (NJ), automobile dealers." Mention is made that he "had previously been connected with Sperling & Sperling, a women's clothing concern of New York." Star Pleating was founded around 1906 by Adolph Hackle Cohn (sometimes spelled "Cohen") (1879-?) as Star Plaiting Co. at 344 6th Ave. (Click for notice of a fire at this address in 1908.) Cohn was an immigrant from Austria/Russia/Germany (1910/1920/1930 US Census reports) in 1885. The business was located at 151 W. 26th St. from 1924 to 1927, and continued for many years after (until the early 1970s). An earlier address was 101 W. 23rd St. (Click for ad with this address in 1914.) Another Star Pleating ad shows them at this address in 1920. The Juliet Cloak Co. consisted of the same partnership between Samuel Karash (1883-1974) and his brother-in-law, Joseph M. Eisen (1883-1964) that manufactured ladies' underwear under the business name Karash & Eisen. They were in business together from around 1907? until the mid-1930s. They moved from 577 Broadway near Prince St. (click for ad from 1919) to 151-163 W. 26th St. around 1920 and stayed until 1925 (click for coat ad from 1922). Another Juliet Cloak Co. ad appeared in the American Cloak & Suit Review, December, 1922. Around 1925 Karesh & Eisen began to specialize in children's dresses. One of the last instances of the partnership was the Milo Dress Co., who made children's dresses at 463 7th Ave. from around 1931 to 1935. Juliet Cloak moved to 463 7th Ave. in 1925 (click for "removal sale" ad from Dec. 1924). In 1908 Max Jacob Karesh (1873-?) and Sol K. Karesh (1887-1970) (both were immigrants from Russia around 1890) were in the underwear manufacture business with Nathan Lenowitz on Division St. downtown on the East Side. This business evolved into Karesh & Karesh on Allen St., then several other locations until around 1915 when the name changed to Salable Manufacturing Co. as a manufacturer of children's dresses at 541-543 Broadway (click for "Coats" ad from Apr. 1918). Salable Mfg. became Salable Cloak Co. when the business moved to 151 W. 26th St. in 1922. The name Karesh & Karesh was also retained as a manufacturer of children's dresses. Salable left 151 W. 26th St. in 1926 and continued in business until the early 1960s, although Max and Sol Karesh were not involved after some time in the early 1930s. The firm did business under the names Salable Cloak Co. and Salable Girls Coat Co. The similarity of the names Karash and Karesh as well as the uniformity of the signs for Juliet Cloak Co. and Salable Cloak Co. suggests a connection between Samuel Karash and Max and Sol Karesh and between the Juliet and Salable cloak companies. Indeed, Julius Karash, who is Samuel Karash's grandson, writes (Dec. 2005) regarding his family: "Samuel Karash was my grandfather. He was born in the area around Bialystok, Poland (then part of Czarist Russia) in 1883. He and his family immigrated to New York in 1891. Samuel Karash and Sol Karesh were brothers. Sol Karesh changed the spelling of his last name from Karash to Karesh when he went into business with his brother-in-law, Max Karesh. We don't know what Max Karesh's original last name was, but the story that's been passed down through the family is that he changed his name to Karesh when he used a false passport to get out of Russia. He did this to get out of serving in the Czar's army, where Jews faced a lot of discrimination." This ad for the Salable Cloak Co. appeared in Women's Wear, 24 Feb. 1926. Beneath Salable is a much darker sign for J. Sternstein Co. / Cloaks & Suits (click for image). This company was in business from around 1902 to 1917 and was located here from 1912 to 1914. The proprietor was Jacob Sternstein (1872-1942). He was born in Russia, immigrated to the U. S. in 1891 and became a naturalized citizen in 1902. He first appears in New York city directories in 1902 as a "cloaks" manufacturer at 1 Chrystie St. A few years later the business moved to 90 Canal St. In 1907 Sternstein applied for a passport and asked that it be sent to his place of business, "86 to 96 Canal St., New York." At an earlier date Sternstein can be found on the ship's manifest of the SS Kaiser Wilhelm II sailing from Bremen to New York City in May 1891. He is described as "Jankel Sternstein, age 23, laborer, born Russia." He is accompanied by his wife, Lena, age 21, and an 11-month male child, Isaak. Sternstein's application for citizenship dated 14 June 1902 was filed when he lived at 50 Jefferson St. (downtown on the East Side, near the entrance ramp to the Manhattan Bridge). On this document his birth date is given as 10 May 1874. However, several later passport applications give the year as 1872. From 1919 to 1929 Jacob Sternstein seems to have made his living as an insurance salesman. He appears in the U. S. Census of 1920 living at 512 12th St., Brooklyn (near Prospect Park), when his occupation is recorded as "Agent Insurance." The Sternsteins lived at this same address at the time of the 1910 U. S. Census. The family consisted of Jacob, his wife, Lena, and seven children. The children were born in New York except for the first, Irving, age 20. The son called Irving here would be the 11-month old in 1891, when he was Isaak. This son was usually called Irwin Sternstein, and he registered for the World War I draft in 1917, giving his birth date as 26 June 1890, and place of birth as "Verballen, Russian Poland," and his place of employment as "Jacob Sternstein, Sons, 12 W. 17th St." 12 W. 17th St. was the last location of the business, which does not appear in later listings. Irwin Sternstein (1890-1958) stayed in the garment business. He was president of Sternstein-Diamond Co., clothing manufacturers, in 1925. And he registered for the World War II draft in 1942 when employed at Planet Coat Co., 237 W. 27th St. On his death the Officers and Members of the Garment Club placed a notice in the New York Times (24 April 1958). This ad for the J. Sternstein appeared in The American Cloak & Suit Review, Aug. 1914. In the upper right hand position where in 2002 it said "[Something] Building," there used to be a sign reading M. Aronin / & Sons / Furs. This can be seen on the New York Public Library's Digital Collections in a photo taken by Percy Loomis Sperr in 1927. M. Aronin was Mayer Aronin (1858/59/60-1939). He was born in Vilna, Russia (now Lithuania) and immigrated to the U. S. in 1891. He was in business as a furrier on Bleecker St. from around 1895 to 1903, then as M. Aronin on E. 10th St. and later 118 W. 26th St. In 1912 the company became M. Aronin & Sons. The first of the sons were Abraham Aronin (1886-1963) and Max Aronin (1888-1971), who were followd by Isidor Aronin (1890-1940). They were born in Russia/Lithuania and immigrated soon after their father in the 1890s. Younger brothers, Joseph Aronin (1895-1982) and Morris Aronin (1897-1956), were born in New York City, and were also part of the family business. M. Aronin & Sons were located here at 151-163 W. 26th St. from 1924 to 1930. The company stayed in business under this name through 1971. In 1971 Max Aronin died, leaving only Joseph Aronin surviving among the five brothers. Joseph Aronin stayed in business under his own name until his death in 1982.